Jan 24 2017 Can a faith-based cross-sector partnership be a partnership of equals? Religious communities are being called upon to do more than just attend to the spiritual needs of their members. As we see more cities and states, such as Detroit and Illinois, struggle to remain solvent; community uprisings in places like Ferguson, MO, Baltimore, MD, and North Charleston, SC; and the continuing erosion of our social safety nets, faith-based organizations are being asked to go beyond their traditional social services such as food pantries, clothing drives, and other goodwill initiatives. They’re joining with civic, business, and governmental organizations to tackle sustainable community and economic development initiatives such as affordable rental housing, affordable senior housing, K-12 education, GED preparation, job training and placement, small business incubators, alternative banking institutions, commercial redevelopment, and other transformative community endeavors. A faith-based organization, in the broadest of terms, is any organization whose mission is driven by its religious or sacred beliefs. Faith-based community development, in turn, is the engagement of these organizations to achieve more sustainable communities. 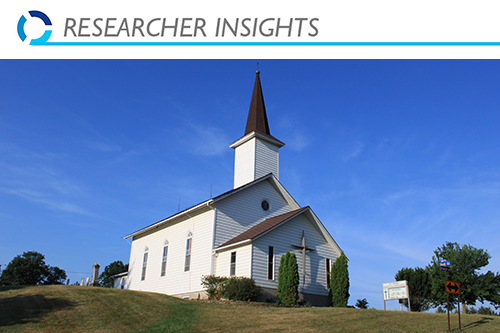 The Hartford Institute of Religious Research estimates that in 2010 there were 350,000 religious congregations in the United States. Of that number, 1,600 are considered mega-churches, with weekly attendance of 2,000 or more. Mega-churches are arguably in the best position to lead large-scale redevelopment in communities as they can leverage their extensive tithes and offerings, real estate, and personnel to manage social programs as well as brick and mortar physical redevelopment. How then can small to mid-size faith-based organizations engage in sustainable community and economic development? One word: partnerships. However, given the small number of such congregations, it is imperative that we focus on the small to mid-size organized faith communities, as they represent the typical congregation. These smaller organizations often have seemingly insurmountable obstacles to engaging in more sustainable community and economic development initiatives. They do not have the financial resources of a mega-church nor do they have a full arsenal of paid staff to carry out the tasks. How then can small to mid-size faith-based organizations engage in sustainable community and economic development? One word: partnerships. My research examines the inner dynamics of partnerships between small to mid-size faith-based organizations and secular organizations. In one case I studied, a small neighborhood Protestant church partnered with a non-profit countywide food bank to deliver fresh produce to the local community. The church was one of many stops for the food bank. Fresh produce would be delivered to the church by the food bank’s refrigerated trucks and church volunteers organized to distribute the food to local residents. For this smaller congregation, the overall goal of outreach into the community served two purposes: (1) to address a community need and (2) to share their faith with the community and invite them to join the church. However, the food bank partner vetoed the church’s intention of using this outreach as a way to share their religious beliefs with the community. This was a particular hardship for the church as its membership was already dwindling. So the church had to forgo its goal of using the partnership as an opportunity to add numbers to its congregation. This is a critical issue: When partnering with a secular agency, it is really important for the faith-based organization to make sure that their core goal of the partnership is also met. In the second partnership I studied, between the ministerial alliance and a bankers’ consortium, priorities evolved away from the original mission of the faith-based organization. The ministerial alliance wanted to establish a Community Reinvestment Academy. This academy would focus specifically on capacity building at member churches (i.e., training church staff on hard skills such as computer software and soft skills such as community engagement) with the ultimate goal of building enough internal capacity so that these individual churches could engage in larger scale community and economic development initiatives. However, capacity building among faith-based organizations did not provide a direct return on the investment for the banks. In particular, the banks wanted to reach out to the non-banking population (i.e., individuals using check cashing establishments instead of banks) thereby growing their market share. The partnership’s goals quickly shifted away from the idea of capacity building for the faith-based organizations to financial education, conceivably so that the banking partners could eventually sell their banking products (i.e., checking accounts, mortgages, car loans, etc.) to these new customers, and job readiness training and placement, perhaps so that more individuals would qualify for banking products. There is no way to overstress the need for partners to have symbiotic goals when engaging in community redevelopment. Part of this mission drift had to do with the resources each partner brought to the partnership. It was the bankers’ consortium that had the most needed resource (i.e., finances) for the activities that the partnership aimed to accomplish. It became quickly apparent that the partner with the most needed resources drove the agenda of the partnership. Mission fit and value convergence. There is no way to overstress the need for partners to have symbiotic goals when engaging in community redevelopment. I say symbiotic instead of similar because organizations can have unique or very different missions but choose to carry out the missions in a way where mutual collaboration can happen. For example, Erie, Kogan, and MacKenzie (2010) report on the cross-sector partnership between Rio Tinto, a coal developer, and Earthwatch, a non-profit environmental sustainability organization. While on the surface the two would appear to be polar opposites, they were able to forge a partnership that was mutually beneficial. Rio Tinto wanted to improve corporate optics and invested in the work of Earthwatch, and Earthwatch benefitted from their sponsorship. However, care has to be exercised. The same authors offer a cautionary tale of public-private partnerships where the public-sector mission was to increase affordable housing, but their private-sector partner sacrificed a number of affordable housing units in favor of higher profits. The partners did not share the same values (namely prioritizing affordable housing over profit). In terms of faith-based cross-sector partnerships, the issue of value convergence and mission fit will be paramount. Collaborative partnership structure. Within the faith-based partnerships I studied, there was a wide range of partnership structures. On one side was the non-needed partnership where one partner did not really need the other to carry out the objectives of the partnership. In the middle was the collaborative partnership where ideas were vetted as a group and decisions were made by consensus. And on the opposite end was a dictator partnership where one partner’s influence greatly outsized the other and drove the agenda and outcomes of the partnership. To create a collaborative partnership structure partners must have an explicit conversation about how decisions will be made and how ideas will be vetted. Each partner must have equal voting rights, veto power, and creative license. Resource valuation. Given that faith-based organizations may find themselves partnered with a resource-rich organization, it is imperative that the type of resource or the value of the resource each partner brings to the partnership does not influence the partnership structure. Each partner has a competitive advantage that the other partner does not have, and that competitive advantage in terms of the resources that each brings has to be respected and valued equally. While it is always preferable to have a partnership of equals, it is not always possible or practical if the faith-based organization is not a mega-church or heavily financed. Mission fit and value convergence, partnership structure, and resource-valuation offer opportunities to infuse equality into faith-based cross-sector partnerships, creating a strong base for success. Erie, S. P., Kogan, V., and MacKenzie, S.A. (2010). Redevelopment, San Diego style: The limits of public-private partnerships. Urban Affairs Review, 45 (5), 644-678. Tonya Nashay Sanders is an Assistant Professor of the Graduate City and Regional Planning program at Morgan State University School of Architecture and Planning. Dr. Sanders’ research focuses on faith-based community development including cross-sector partnerships, community development corporations, and curriculum.